As a Recognised Mediation Accreditation Body (RMAB) in accordance with the Australian National Mediator Standards, VADR is able to offer Mediator Accreditation to members who meet these national standards. Please note that members who are Accredited Mediators with other RMAB organisations are automatically eligible for Accreditation as a mediator with VADR. The Mediator Standards Board has set a fee of $100 for accreditation, which must be renewed every two years. The application forms are available via the links below. These standards need to be read thoroughly before applying for national accreditation.Click here to download a PDF file of the NMAS Approval and Practice Standards 1 July 2015. 1. Print out and complete the application form, then scan your completed form. 2. 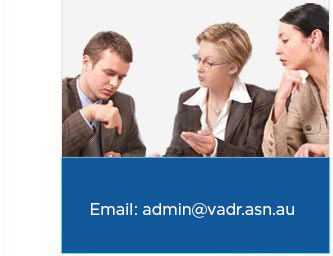 Email the scan of your completed form to admin@vadr.asn.au, ensuring that you have also attached all relevant supporting documents. 3. Deposit/transfer $100 (being two years' MSB fees) into the Victorian Association for Dispute Resolution bank account (BSB 06-3009, Account number 1018 2266). Please remember to include your name in the reference field so that we can identify your payment. To pay by credit card, please email card details to admin@vadr.asn.au or phone Deborah Macfarlane on 0432 498 639. Note: Your application cannot be passed to the Accreditation Committee for consideration until all of the above steps have been fully completed.